Well, looks like third time's the charm. Daina is an expert marksman in the Oktober Guard and its only female member. Known for her chronically bad temper, Daina is also the most tactically intelligent member next to Colonel Brekhov, and often takes the role of second in command. Her rough edge is tempered by her coolness in the field, when patience and silence are essential to achieving a hit on her target and completing the mission. As the only woman in the group, Daina feels compelled to do twice as much to prove that she deserves a place on the Oktober Guard team. She is multi-talented and can pilot any vehicle in the Soviet arsenal. She is also exceptionally skilled with all Warsaw Pact weapons, but her favorite is the SVD, or Snaiperskaya Vintovka Dragunova (Dragonuv sniper rifle). 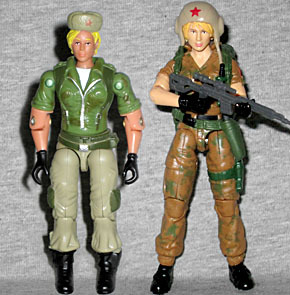 The first time Hasbro released a figure of Daina (for some reason codenamed "Volga"), she was a repainted Lady Jaye with a new head. 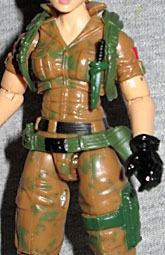 The second time Hasbro released a figure of Daina, she was a repainted Lady Jaye with a new head. Now we've got our third Daina; want to guess what parts she's made from? Well, you're partially right. 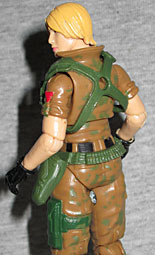 The upper body is all Lady Jaye - not this one, one from a later box set - but the legs come from Paris Pursuit Snake-Eyes. It's a good combo, really. The upper body is feminine (duh), but Snake-Eyes' legs are slender enough that it just looks like she's wearing thick winter pants, a style that makes sense for a Russian operative. The head is new, and is the first time she hasn't been molded wearing a hat - the first one had a ballcap, the second one had an ushanka, and this one has nothing but her blonde hair. The face is cute, and the hair is plastered down against her scalp pretty tightly. Considering she usually wears a helmet, that's a good choice. And yes, she comes with the helmet. It's a light tan with a red star in the center, tying her in with the rest of her team. Her uniform is the same color seen on Schrage, but hers has a green camouflage pattern breaking up the brown. She has black boots and gloves, and the add-ons to her clothes - the holster, the straps on her leg and arms, etc - are done in green to match the camo. There's a triangle sculpted on each sleeve, and those are painted red. This isn't Daina's classic uniform, but it works for her, and makes her look like part of a team. Beyond the helmet (a reused Star Wars piece, of all things) and the removable harness on her shoulders, Daina comes with the same parachute as Stormavik, an AK-47, a pistol to fit in the holster on her hip, and her trademark Dragunov sniper rifle. 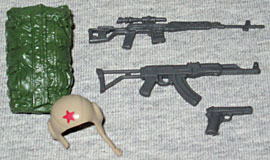 The guns are all molded in grey plastic, and she holds them well. Daina is, along with Horror Show, easily one of the most popular members of the Oktober Guard. Hasbro could have made a Comic Pack just featuring the two of them and it would have sold like hotcakes. Instead, she's a Collectors' Club exclusive, meaning crazy high prices if you want to get her secondhand. Rest assured though, she's well-made, and this is the best representation of Daina yet.